Here we have a 640sqft Basement Floor that was in bad shape it had over 300 small and med size holes in the surface from pulling the carpet strips, it had black mastic in both bedrooms that was very stubborn to remove we had to grind the entire surface down the the bare concrete, once the grinding was done we discovered many cracks that were not detected until the grinding was finished, so we repaired all the cracks and there were alot of them. 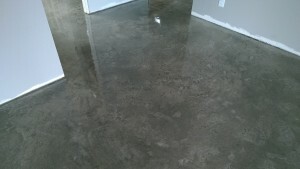 Once we removed the mastic and repaired the holes and cracks we were able to start our cleanup, after clean up it was time for the base coat of concrete, the base coat went on very nicely and really made the floor look new again! Next step was to start layering our texture, we did 2 top coats of a slighter lighter in color concrete but this was a 50/50 mixture the mixture we did gave us a less grainy feel and a more creamy smoother finish, coverage was at about 85% coverage, we wanted to create smaller pockets so we could see our first base coat which is basically how a Tuscan Slate finish is done. Now that we have Texture it was time to paper everything off from any over-spray because it was time to start spraying our Antiquing Stain onto the floor, once the masking/papering was done we mixed our stain and poured it into a pump up sprayer and proceeded to spray the surface. We had to put 3 Antique coats down to get the correct shade. It was now time for the High Gloss Epoxy Finish to make the coloring POP! 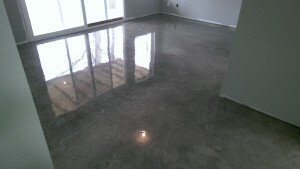 !….The Epoxy went down as expected smooth and efficient and looked AWESOME! !